Google is a dream company to work for, for universally just about anyone. Their much vaunted culture, perks and opportunity to be part of being a cutting-edge innovator attracts millions of resumes and job applications. 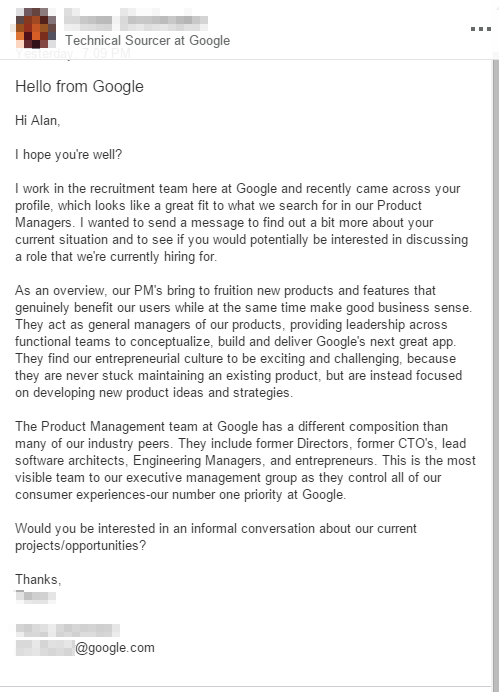 So, a Google recruiter approaching someone for a high profile position should come as a windfall. However, not if you’re the co-founder and CEO of a fledgingly successful app yourself. Recently, co-founder and CEO of the call-identification app Truecaller received an email, purportedly from a recruiter at Google. The recruiter was sending a feeler out to the Swedish technepreneur about a job opening at Google, and wanted to gauge his interest for the same. The recruiter, cognizant of the fact that it’s the CEO of an established startup they were reaching out, goes on to explain how the product manager role is perfect for an entrepreneur and has been graced by included former directors, CXOs and managers in the past. “They find our entrepreneurial culture to be exciting and challenging because they’re never stuck maintaining an existing product, but are instead focused (sic) on developing new product ideas and strategies“, the recruiter explains. However, despite the recruiter’s plea-ful email, Mamedi seems to have been unflattered and decided to go with this cheeky reply instead. Fair enough, if Google wants to wants to hire Mamedi, a CEO, no less than the Google CEO Sundar Pichai himself should be the one interviewing. Now here’s one meeting we will be watching out to see if it happens.